A great selection of Jungle Safari themed products to suit all ages, Suitable for many areas including the home, workspace, nursery, school, hospital. Five fun jungle Safari animals in a circle. A Lion, Elephant, Zebra, Giraffe and a Hippo all ready to keep your children happy in the bedroom. Printed on a self adhesive peel and stick vinyl. Was £20 Now only £15 !! 45cm High x 32cm Wide £15 Now only £10 !! Each Animals is seperate and just need peeling off and applying to a flat surface. •Decor for the nursery, children's bedroom. •Ability to change your children's room decor in seconds! 2 sheets Each sheet: 15¾" x 19¾"
Baby Giraffe self adhesive sticker. Adding to your wall mural or just starting off. Creating a childrens jungle themed mural with these wall stickers is easy, Just apply peel and stick, its really childs play. Charlie the cheeky chimp looks great placed just over a door or on a shelf. These childens wall stickers are very easy to use, You can choose from a large range including Jungle animals, Dinosaurs, Birds or Underwater sea life and Farm animals. Each Sticker is virtually life size (see dimensions) and can be used individually, or combined to create a themed wall, Great for nurseries, playrooms and bedrooms alike. Simple to use....Just peel and stick...its that easy !! This range of wall sticker leaves no residue on the wall and will not damage the wall when removed. Kids love them as well as grown ups !! Buy the Safari circle and the Peek a Boo and receive Safari Playtime FREE ! Buy 2 Get one Free !! 119.38cm x 76.2cm (47" x 30") He's a big one ! 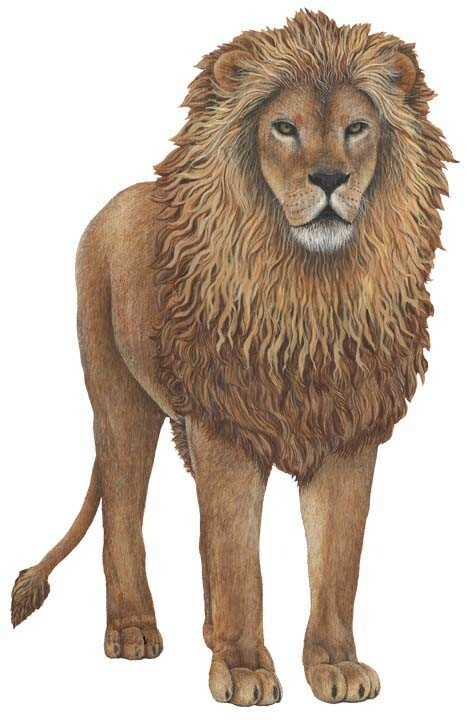 The Jungle Lion - self adhesive sticker. 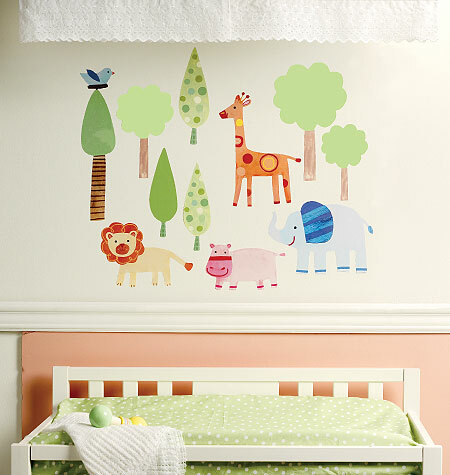 Creating a childrens jungle themed mural with these easy to apply wall stickers makes decorating childs play. Mix in a few jungle plants and trees and you have your own Jungle themed wall mural. have great fun while they're at it! Let your children experience the Jungle as the real monkeys do. This Jungle Adventure sticker kit consists of 54 stickers. High quality stickers that can be placed on any wall or all walls, Doors, Furniture and even glass. Elephants, Lions, Giraffes, Rhino's, Crocs, Zebra's, Monkeys and more, There are even plants and branches to allow you to create a real Jungle scene within the room. Each set includes 6 sheets of stickers. Each sheet measures 46cm x 34cm. 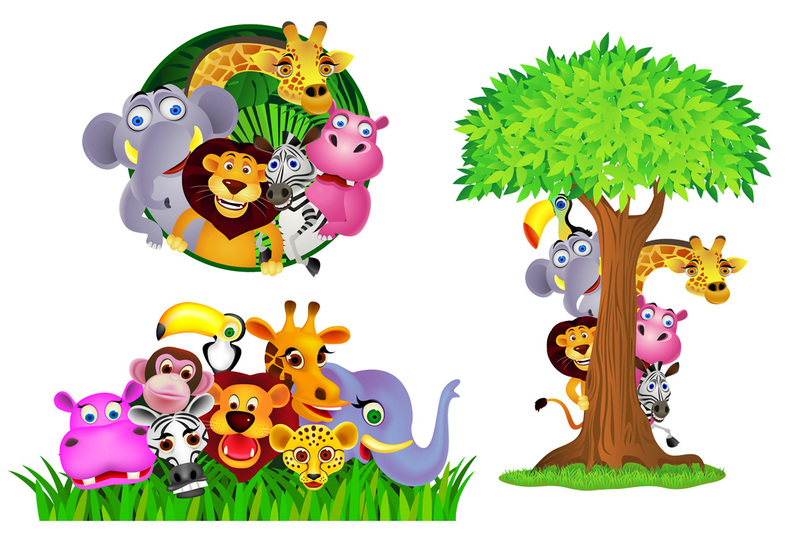 Fun-Decor are proud to announce these new Jungle Animal range of wall stickers for kids. 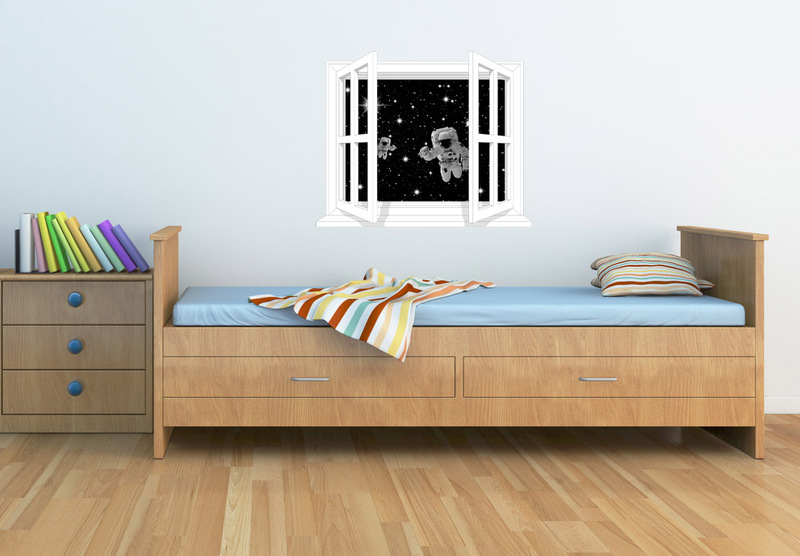 These funky bedroom wall stickers create a stunning effect that children love, boys & girls alike. 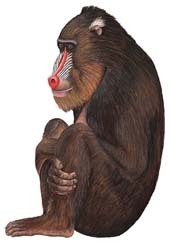 A Baboon wall sticker that stands over two feet tall. 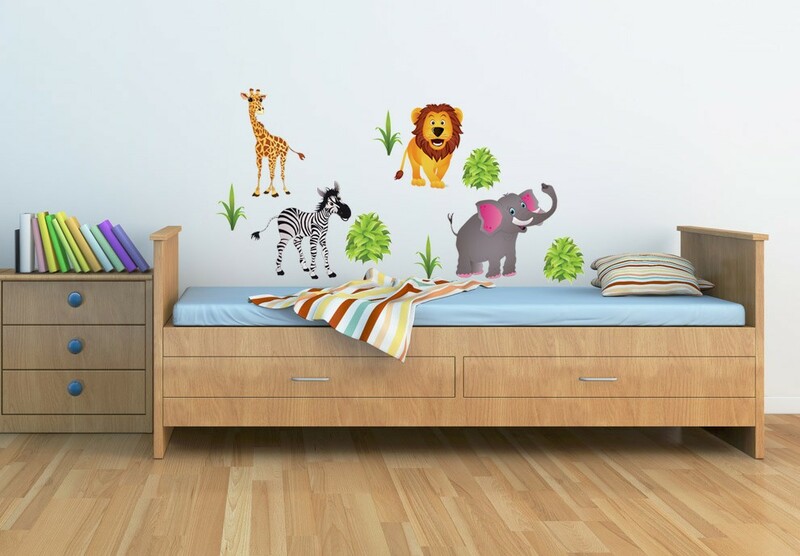 These wall stickers are very easy to use, You can choose from a large range including Jungle animals, Dinosaurs, Birds or Underwater sea life and Farm animals. Each Sticker is life size (see dimensions) and can be used individually, or combined to create a themed wall, Great for nurseries, playrooms and bedrooms alike. 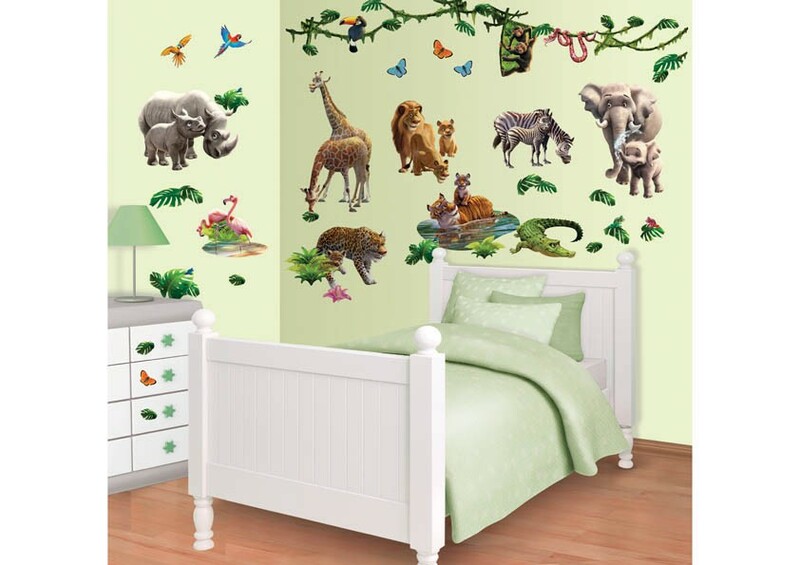 Jungle themed walls are ideal for schools and Nurseries and even University accomodations. Easy to apply....just peel and stick. Add to your jungle themed wall mural with this Cobra snake sticker. Measuring in at 149.86cm x 40.64cm 16" x 59"
These kids wall stickers are very easy to use, You can choose from a large range including Jungle animals, Dinosaurs, Birds or Underwater sea life and Farm animals. Ideal for girls & boys bedrooms and suit children of all ages. Each Sticker is virtually life size (see dimensions) and can be used individually, or combined to create a themed wall, Great for nurseries, playrooms and bedroom alike. 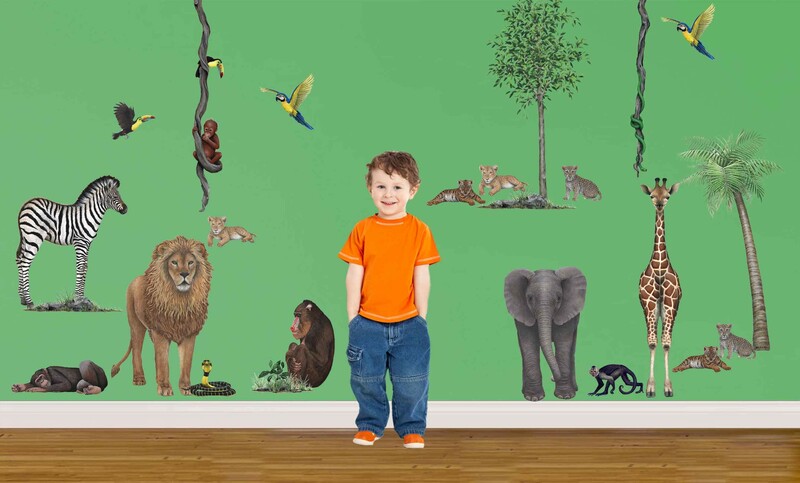 Jungle themed walls are ideal for schools and Nurseries and even University accomodations, Use just one or select a few animals and a few plant stickers and start to build your very own wall mural. 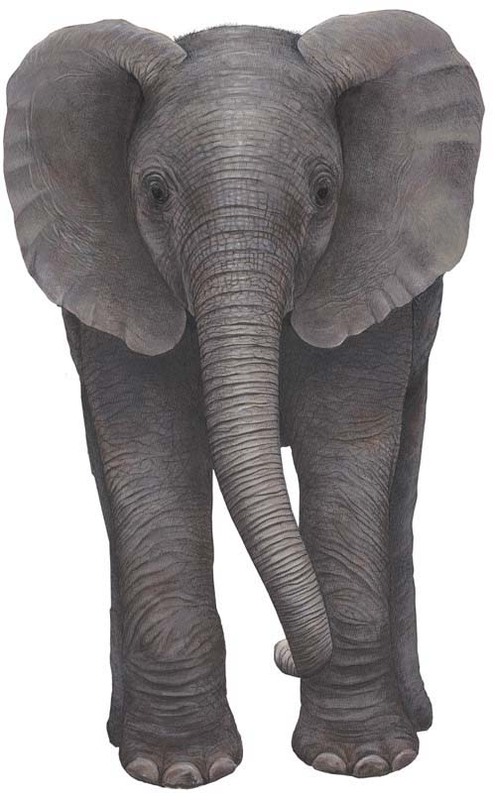 "Elle" the Baby Elephant self adhesive sticker. Fun decorating made easy, kids love them !! 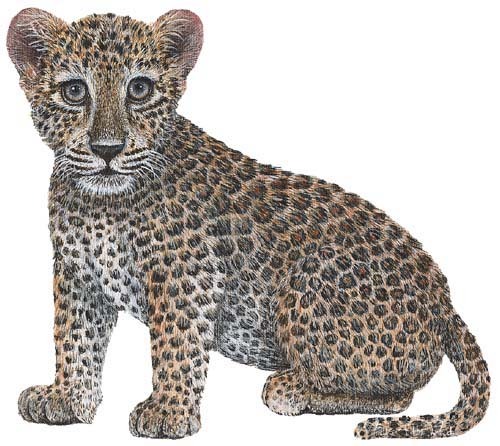 Baby Leopard cub self adhesive sticker. 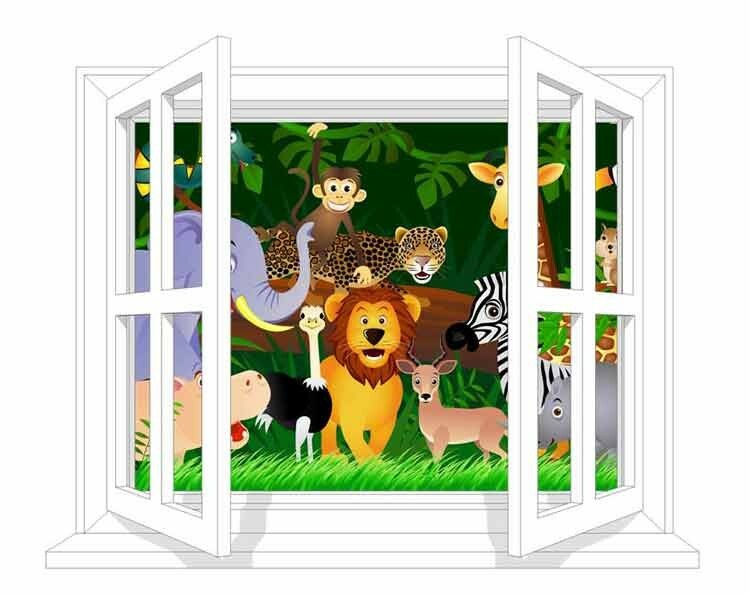 Why not create a children's jungle themed mural with these easy to apply stickers.Loads of jungle animals to choose from, then justa dd a few plant / tree stickers to complete your jungle scene. 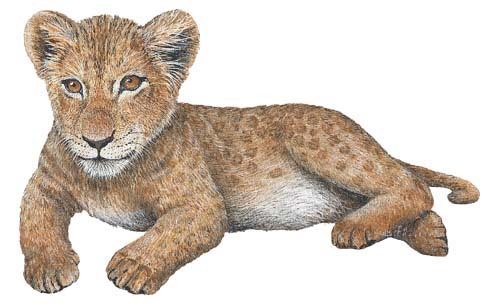 Baby Lion cub self adhesive sticker. 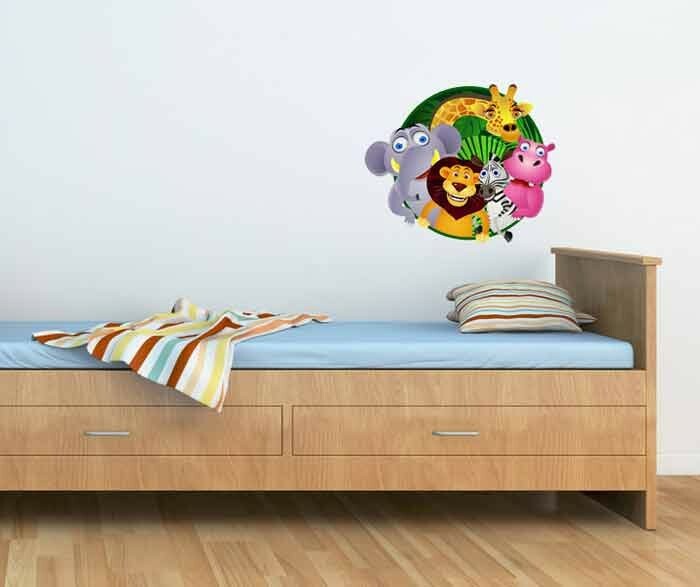 Start to create a childrens jungle themed mural with this easy to apply bedroom wall sticker. You can mix it with other borders to set the foundations to your mural. 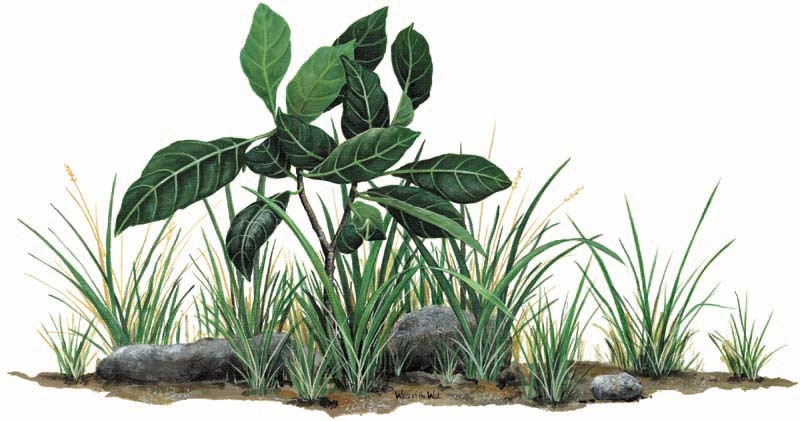 By adding a selection of these large scenery decals such as border plants and trees your murals will have great depth. Works well with both Dinosaurs and Jungle Animal wall stickers. Don't under estimate how effective these border pieces are, they really do set the scene for your Jungle / Dinosaur wall mural. Easy to apply just peel and stick, its that simple, A great addition to your Jungle themed wall mural. Set the scene with this giant Palm Tree wall sticker, we have two sizes available, this being the biggest. Just add a few other plants and a few dinosaurs, jungle animals or farm animals and you'll have a wall mural to be proud of. 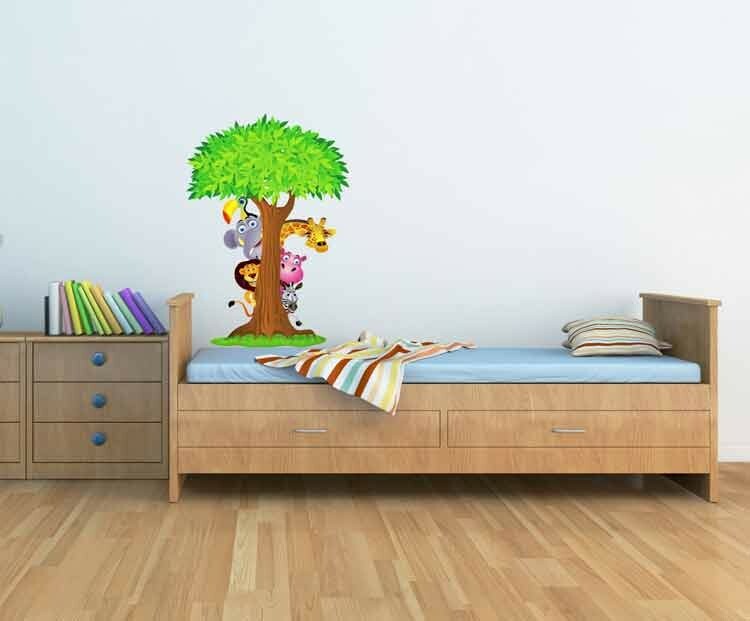 Add few other plants and trees and then some Dinosaur stickers or Jungle animals and you'll have everything you need to complete your very own wall mural. Not just for bedrooms but these giant wall stickers look great in schools, colleges, hospitals and waiting areas such as doctors surgeries. 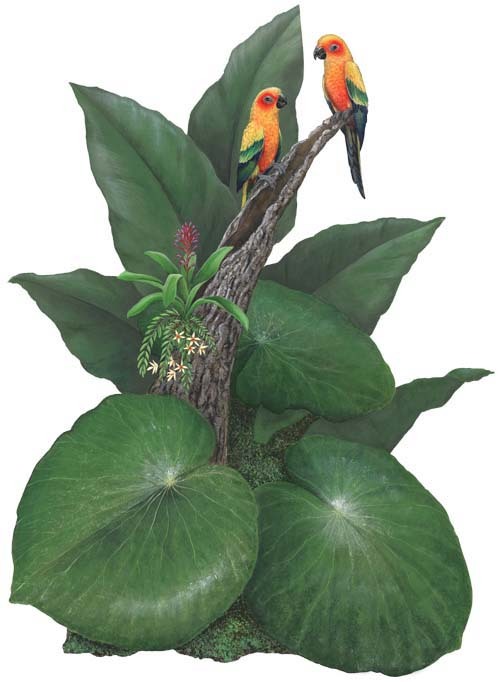 114.3cm x 81.28cm 32" x 45"
This decal is just one of many Jungle scenery decals available, They set the scene as a wonderful background to your mural and should not be underestimated. By adding a tree, perhaps a few plants and borders your animal decals will come to life and seem more realastic. 243.84cm x 88.9cm 35" x 96"
The rainforest tree decal is a must for large wall murals, this is a big sticker and provides you with a great frame for your mural. 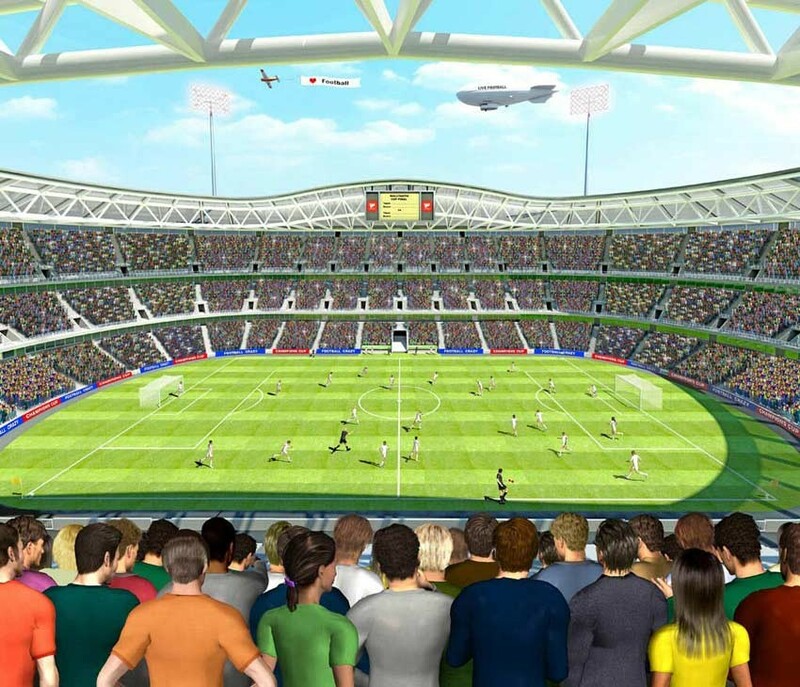 When used in conjunction our other scenery wall stickers will give your mural a great sense of depth and perspective. Measuring 43.18cm x 114.3cm 45" x 17"
These colourful flower borders decals area great addition to your mural and create a frame to your scene. These borders are over one metre wide and give your mural depth and a sence of perspective. Not to be underestimated as they will make the animals or dinosaurs in your mural look more realistic. (72" x 36") So it's pretty big ! Dont under estimate the effect of these border stickers, they really do give your mural depth framing the scene. 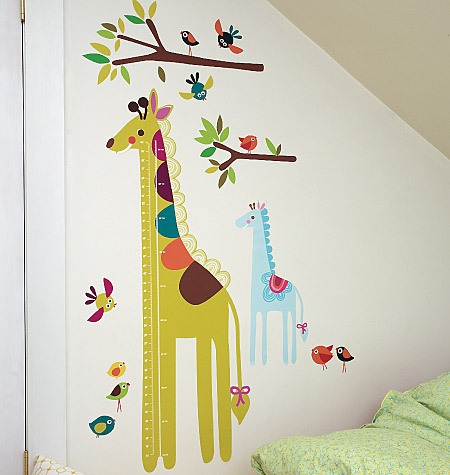 A tall sticker that covers a large portion of the wall, creating the effect of the jungle scene. Eight fun jungle Safari animals ready to play in the long jungle grass. The animals include a Lion, Elephant, Cheeter, and a Giraffe, Toucan, Monkey, Zebra and even a Zebra. 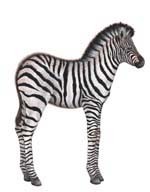 Four fun jungle Safari animals that can be peeled off and placed on bedrooms walls or furniture etc. 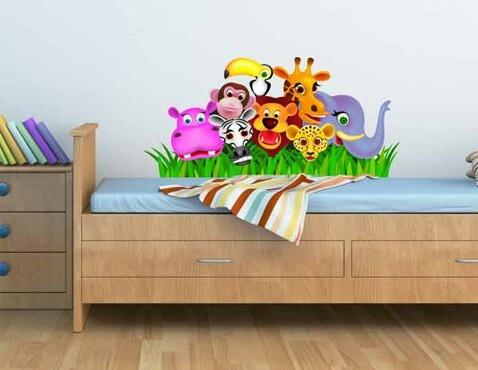 An Elephant, Lion, Zebra and a Giraffe are ready to keep your children happy in the bedroom. Add the included little grass & bush stickers to complete your Safari scene. 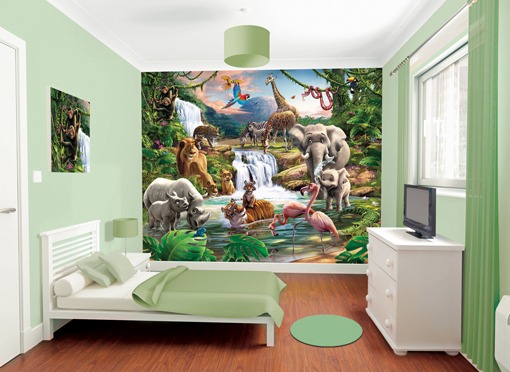 This fantastic Walltastic Jungle wall mural will bring life to any childs bedroom, play room or nursery. Elephants , Giraffes, Monkeys, Crocodiles, Rhinos, Lions, Hippo's, Zebras etc etc. All set in a wonderfull jungle paradise. Click the picture to find out more. (can be trimmed to size with ease) WOW ! !